In February 1987 members of Penry Ladies' Choir and their conductor Marie Charles called a public meeting at the Congress Theatre in Cwmbran. The hope was to create a mixed choir open to any who wanted to join. The response was immediate and so enthusiastic that rehearsals were underway within no time and, at Christmas, the newly named Torfaen Choral Society performed its first Concert at the Congress Theatre. The audience was thrilled to hear again this great choral sound that had been lost to Cwmbran. Concerts went on to not only provide great pleasure but also to gain plaudits for achieving such a high standard of performance. With a steadily expanding repertoire came prizes at eisteddfods like the South Wales Miners' Eisteddfod at Porthcawl, the Welsh National Eisteddfod in Mold and then acclamation from audiences in Belgium, the Cork Music Festival and Caen. Early in 1997, Torfaen Choral Society celebrated its 10th anniversary by staging its first concert to have an orchestral accompaniment. Under the leadership of Marie Charles Mozart's Mass in C Major (Coronation Mass) was accompanied by the Welsh Sinfonia. The evening was a great success and everyone felt a wonderful sense of achievement. Sadly, Marie's health began to fail and, when she was unable to conduct the choir's 1998 concert, Jeanette Massocchi stepped in to help. Jeanette kindly took over the role of Musical Director from 1999 onwards assisted by Mary Morris and Jackie Charles, both brilliant piano accompanists and teachers, and D. Martyn Jones who tutored rehearsals and acted as assistant conductor. The choir took part in the Massed Choral Concert held in Cwmbran Stadium to celebrate the 50t h Anniversary of Cwmbran New Town and marked the last Christmas of the 20t h century at the BBC Songs of Praise staged at the Millennium Stadium in Cardiff. In 2000 the choir was selected by Torfaen County Borough Council to celebrate the Millennium by joining Samba, Brass and Jazz bands in Crossing Borders by Rob Smith to portray the history of Torfaen. By 2006, the choir was performing full choral works ranging from Renaissance and Baroque to the Twentieth Century, as well as variety concerts which included an eclectic mix of such as traditional folksong, modern ballads, musicals and classical items; taking part in Mayoral Charity Concerts, winning Eisteddfod prizes and performing concerts in Prague and Krakow. 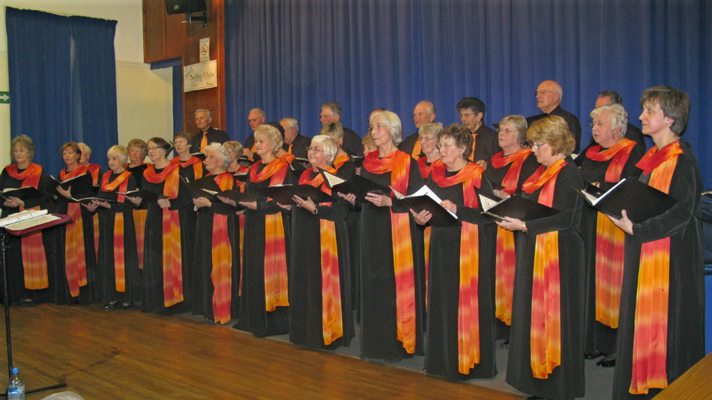 2011 saw the choir performing "A Night at the Opera" at the Borough Theatre in Abergavenny, a change of direction so well enjoyed by choir, soloists and audience that it led to a very popular light operatic evening staged at Llanyravon Methodist Church in 2012. Whilst audiences have enjoyed choral music at its best, concerts supported by the Community Councils of Henllys, Cwmbran, Croesyceiliog and Llanyravon; Torfaen County Borough Council, Melin Homes, the Welsh Church Fund, Ty Cerdd (Welsh Amateur Music Federation) and the National Federation of Music Societies have raised thousands of pounds on behalf of many aid organisations, among them local animal sanctuary A l l Creatures Great and Small, the Society for Prostate Cancer, the Aphasic Society, the Guide Dogs for the Blind Association, the Arthritis and Rheumatism Research Association, Cerebral Palsy, Mencap, the Muliple Sclerosis Society, the Society for Kidney Research, Llandough Hospital (LATCH), the Children's Hospital in Wales (the Noah's Ark Appeal), Marie Curie Cancer Care, the St. David's Foundation for Hospice Care and Ty Hafan Children's Hospice. Twenty-six years' choral singing has been a happy learning and performing experience but circumstances have now brought the choir to the decision to disband. Rehearsals in the hospitable surroundings of Llanyravon Methodist Church will cease in April. Torfaen Choral Society will give its final concert at St. Gabriel's Church, Old Cwmbran, the chosen venue for so many memorable occasions including the Society's 10th and 20th Anniversaries. Starting at 3.00pm on Sunday afternoon, 21 April 2013, the choir will sing Puccini's Messa di Gloria and items from Handel's Messiah conducted by Jeanette Massocchi. They will be joined by distinguished friends Soprano Anne Wilkins, Tenor Richard Allen, Baritone Andrew Jenkins, organist Hugh Thomas and St. Woolos' Players. A special reduced price of £3.00 will be charged for admission. For tickets please ring 01633 791492.